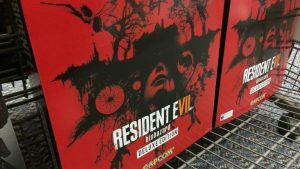 Promotional boxes for Resident Evil 7: Biohazard. Sleepless nights are in store for gamers as the series that created the survival horror genre, “Resident Evil,” returns to its roots. “Resident Evil 7: Biohazard” will be the newest addition to the series which last year celebrated its 20th year anniversary. The game was announced at the 2016 Electronic Entertainment Expo and was meet with a mixed acclaimed from fans of the series. Some praise the game which looked to be a return to the creepy and unsettling atmosphere of the original games, with others condemning the change of perspective for the game to first person from the traditional third person the series is known for. This standpoint stood until trailers of the game began to show the main character using weapons and combating threats. “When I first played beginning hour, I thought maybe Capcom was just cashing in on the leftover hype that the “Silent Hills PT” demo started,” said Austin Turner, an Azusa Pacific student. When the game was announced a demo was also released on the Playstation 4 titled “Resident Evil: Beginning Hour,” which fans took a liking to due to the demo having hidden clues instead of just game play from the final product. “Resident Evil 7: Biohazard” will mark the third change in perspective for the main franchise which started with a fixed camera angle third person perspective in the first few games, with the last few games being an over the shoulder third person perspective. Despite this new change in perspective, Capcom assures fans that the game will play in a similar style to the original “Resident Evil” with a focus on conserving items with a limited inventory and puzzles, something that has been diminished in recent entries to the series. Capcom has stated unlike most games in the franchise, “Resident Evil 7: Biohazard” will not have any returning characters and feature an entire new cast. “If I play in VR it is going to be more personal because the VR makes it more realistic,” said Kalib Putnam, an employee for six years at the GameStop at the Redlands Pavilion in Redlands, CA. A feature that will be available exclusively to PS4 users for a year will be the ability to use VR to experience the horrors of the Baker Estate. “As I started to hear more info about [“Resident Evil 7: Biohazard”], I started to realize that Capcom really were making something unique,” said Turner. “Resident Evil 7: Biohazard” promises to be a return to form to the way that the original games handled item management, the amount of ammo and the way puzzles will be handled. The world of survival horror will once again welcome fans new and old starting January 24th.